Thanks to the many apps, websites, and airline flash sales at your disposal, finding damn good deals on flights has never been easier. At the same time, it's just as easy to get burned in the process by waiting to book a flight, only to find the fare has doubled just days later. But now, Google hopes to change that with a new feature that alerts you when prices are about to increase. 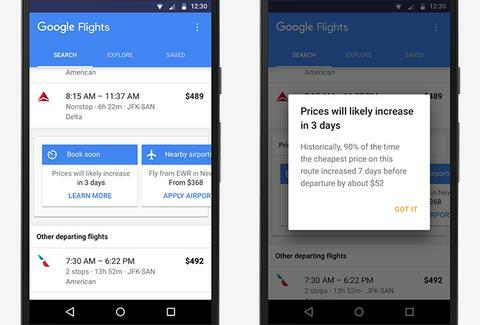 Google said the new functionality will roll out to its Google Flights tool over the next few weeks, along with other helpful features that will make booking a flight slightly less painful. Specifically, Google Flights will let you track flights and routes by sending you email notifications when the prices are expected to change based on historic fare data (of which Google presumably has a shitload). You'll also get an email when the fares actually do increase and -- perhaps best of all -- when the fares dramatically decrease. In other words, you can sweat less now when you're unable to book a flight right away. Along with the fare tracking notifications, Google Flights will also display price increase warnings right when you select a specific flight, letting you know when the current fare is expected to expire and how much the price might go up. So, for example, if you're looking to book a flight to Chicago that's currently priced at $225, a red box will appear on your screen warning you that the fare is expected to increase by $90 in six hours. That could very well be the difference between booking right away and being able to hold off and shop around without having to worry. Google is also adding new features to its hotel searched capabilities that will make it easier for you to find deals and faster. All said, you have at least one fewer excuse not to get the hell out of town and enjoy yourself sometime soon. JetBlue's huge flash sale (October 18-19) certainly helps, too. Tony Merevick is Cities News Editor at Thrillist and thinks all these cheap flight stories lately are a sign that he needs to take a long vacation. Send news tips to news@thrillist.com and follow him on Twitter @tonymerevick.